So I stumbled upon Holly's West, located at 2460 Wilshire Blvd in Santa Monica. 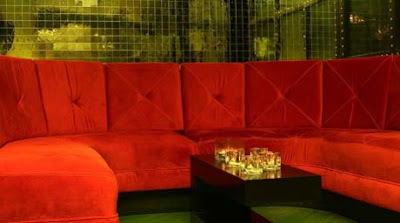 I was quite impressed with the Venetian-style lounge furniture with red velvet upholstery and super-low cocktail tables. Not to mention the ahi tuna tartare, crab cakes and the mini-burgers. 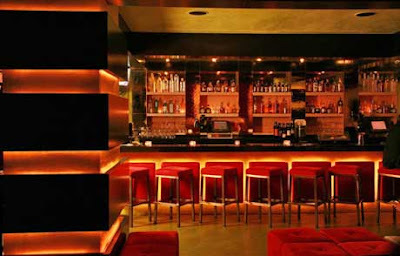 Holly’s West has succeeded in bringing the class and sophistication of any of L.A.’s hottest spots west of the 405. So if you want a taste of Sunset Boulevard but don’t feel like heading north of Wilshire, head over to Holly's West. The full bar features an extensive affordable wine list priced from around $25 per bottle. Save the valet charge! There's usually easy to find parking along Wilshire, which is free after 6pm. Holly's West is open from Tue-Sat 5pm-2am. Call (310) 828-3304 or click the title link for more info. Ooooo, I like. You always find super cool new places, my bf thinks I'm a genious! LOL! I'm glad you likey! !